Gaz, Arrabbiata1, Dr No and 3 others like this. I like the way it's much more open to race fans than the GP paddock . We need more threads like this - excellent stuff Ant. Thanks for sharing these with us Ant. You're a star! To be honest, these bikes are not hiding multi million dollar secrets. Thanks Ant. Even the less advanced RC213V-S which Bruce was riding was hidden from view, only saw that on the race day. Once you get past the main paddock where the "stars" are based and go deep into the bowels of the paddock it gets more interesting with loads of bikes and sidecar oufits operating out of transit vans with a tent as the garage and the missus as mechanic. AntG joined just to say hello and that I appritiate your thread on the race coverage and the pics here. Also want to give a salute to Hutchinson. I remember how special the Macau races were in his come back and the long road he's been down. Amazing stuff. 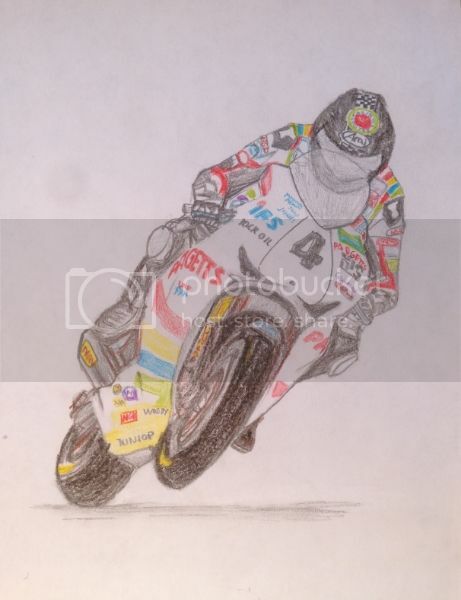 Here's a sketch I made of him in his record breaking year, a few years old now.. I supose I need a newer image to replicate if you got any ideas. AntG and NJIRK like this.